Generates rainbow halos and/or glint-like rays at locations where the Source clip is brighter than the threshold. 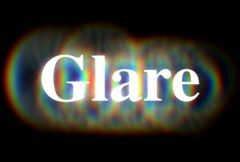 Glares are best observed on dark images with a few bright spots. For even more customization of the glare shapes, use the Convolve plug-in, which lets you use your custom-designed shape from a clip. Source: The input clip that determines the glare locations and colors. This clip is also used as the background and the glares are layered back onto it. Type: Default: 0, Range: 0 or greater. Scales the brightness of the Source input when combined with the glares. This does not affect the generation of the glares themselves. Blur Glare: Default: 0, Range: 0 or greater, Shared .